Exclusive to first-year students, Palmer Hall is the perfect community for students who want to meet other first-year students and get involved at EKU starting their first day! Located directly next to the brand-new campus recreation center, and just steps from the Powell Student Center and Case Dining Hall, Palmer Hall is a perfect location to enjoy the conveniences of campus. 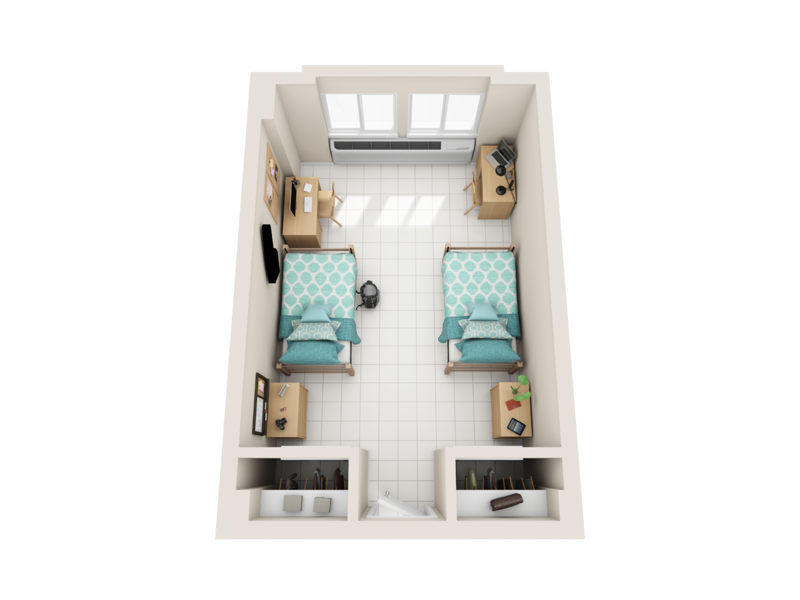 Below you can view an example room layout for the styles offered in Palmer Hall. Please note, these layouts do not reflect the exact room style and should be used as a general reference. Because of the varying sizes of spaces, exact dimensions for specific spaces are not available. Palmer Hall offers Traditional spaces which house two residents per room and offer a community bathroom. Traditional spaces offer affordable living in a close-knit community where students get involved and easily engage with others. Below are the standard room dimensions for Palmer Hall spaces. Please note, spaces vary by size and the below dimensions are reflective of a typical room and to be used as a reference only. Exact dimensions for a specific space are not available. Palmer Hall also offers community TV and computer lounges, free laundry facilities on the 3rd and 7th floor, and a kitchenette facility on the 1st floor.